I recently shared my super painful debt story on Chain of Wealth Podcast. This interview inspired me to create this series. Rise From Rock Bottom tells every story from my failure years - and how I overcame it. In 2015, I was under a mountain of debt. I had about $15K in credit card debt and a $25K car loan on a Mercedes Benz. If that wasn't bad enough, I also had a luxury apartment that easily cost $1500/month. Determined to maintain my credit score, I worked 3 jobs to put food on the table, pay my car note, my high-AF rent and continue making the minimum payments on my various credit cards. I was under water, overworked, exhausted, and out of options. If I stopped to take a breath at any moment, I would fall behind on paying bills, my rent would not get paid, there would be no food on the table. I was the epitome of paycheck to paycheck. By the end of 2016, I landed a job for one of the top Marketing Analytics firms in the world, making triple what I was making with three jobs. My company that lets you work from where ever you want, have unlimited vacation, a robust retirement plan and values me as an individual. Most importantly, I am happy. How did I make this transition in one year? 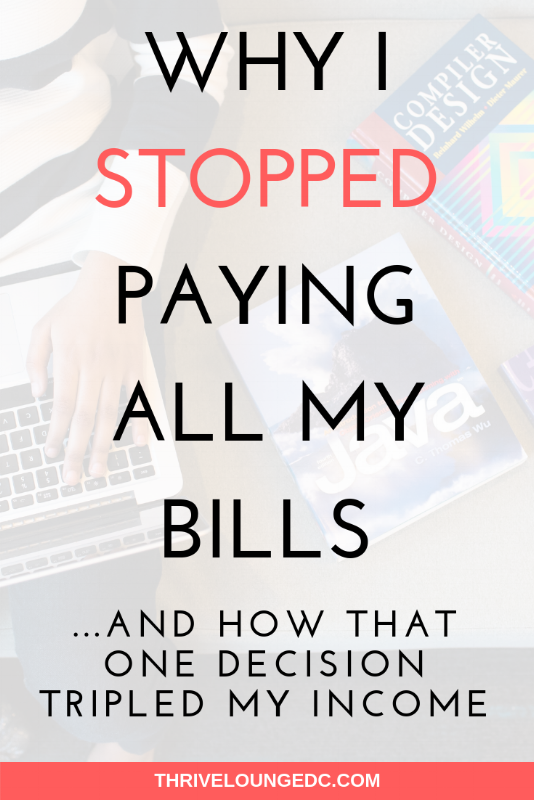 I made the hardest decision of my life: I stopped paying my bills... ALL OF THEM. I called all of my credit cards and informed them I would no longer by paying. I turned my phone off (yes, completely off). I did a voluntary repossession on my Mercedes Benz and bought a crappy car in cash. Lowering my bills meant I didn't need more money. With over $2500 in rent, car payments and credit card minimums every month, I was obligated to work enough hours to cover my bills - EVERY SINGLE MONTH. That means before I could put money into my savings account, buy food or invest in my future I had to make $2500 that would immediately go out the door to pay for my earlier mistakes. I only made $2000-$2200 each month as a receptionist, waitress and low-paid freelancer at the time. That meant that every month I was also spending MORE MONEY ON CREDIT CARDS. Deciding to stop paying my bills and move out of my apartment (and into my moms basement) meant that I would no longer need $2500 each month. Without working any harder, I would now have $2200 each month TO INVEST IN MYSELF. I made the decision to get masters a degree in a high demand, high value and growing field: Data Science. I woke up every morning at 3am and rolled out of bed so I could wake up by the shock (and slight pain) of hitting the floor. (I was training myself for a war I intended to win.) I started studying for the GRE. Within a few months, I had scored well, applied to school and got into the state school near my parent's house. Remember the crappy car I bought with I did a voluntary repossession on my fancy benz? I sold it to pay for as much of my school fees as possible and minimize the amount of loans I had to take out. Because I no longer needed the money, I was able to quit my receptionist and waitress jobs to go to school full time. I even fired all of my freelance clients and only kept the highest paying client. After my nine month master's program, I walked across the stage just one year after starting this journey with an offer in hand - for triple what I was being paid before. At this new job, I made $65K per year. That meant I finally would be able to pay off my debts and also have time for myself, my family and there would be money left over to save and invest in myself. I sacrificed my credit score to improve my life. I am not advocating for scamming your way out of paying for your financial obligations. I am a firm believer that you SHOULD pay your debts. However, that is a choice you CAN make. Without the bills, I didn't need three jobs. Without the jobs, I didn't have to feel stressed every month about creating more income, working harder. I didn't have to burn myself out. I could think clearly about who I was and what I really wanted out of life. With a clear mind, I put myself in a position to change my life permanently. 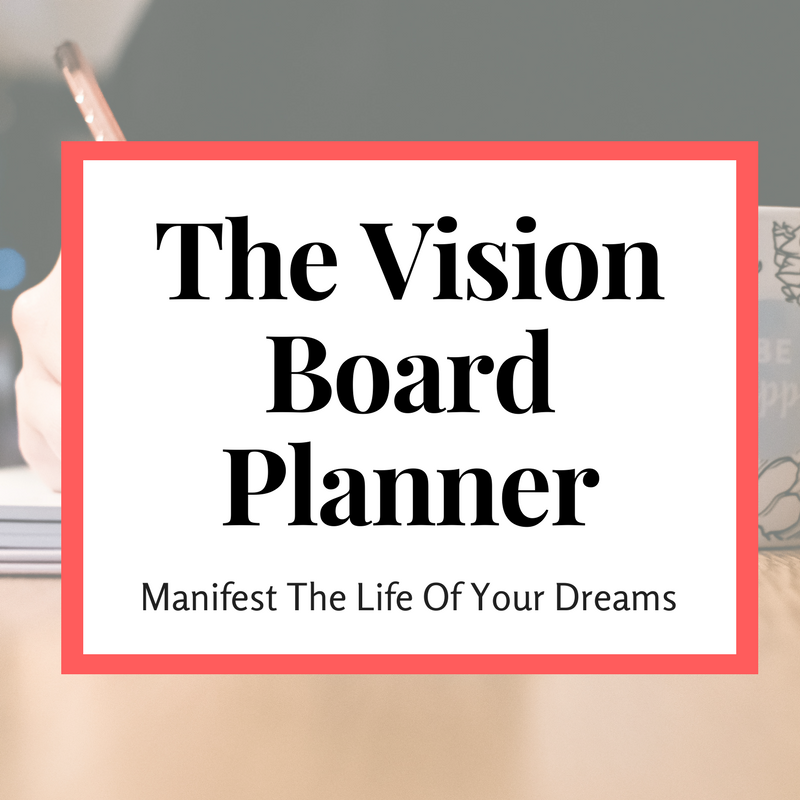 I made the conscious decision to take 10 steps back to (finally) propel myself forward. From where I'm standing, I made the right choice. Many Americans are walking around with a huge cloud following them everywhere they go. Some are fortunate enough not to think about it often though they know it exists. From the moment I realized what my $42K in debt was costing me from month to month, I decided there was no way in HELL I was going to keep living my life this way... especially since (for the first time in my life) I could finally afford to start paying it. I didn't have enough money left over at the end of each month to make a dent in my debt. 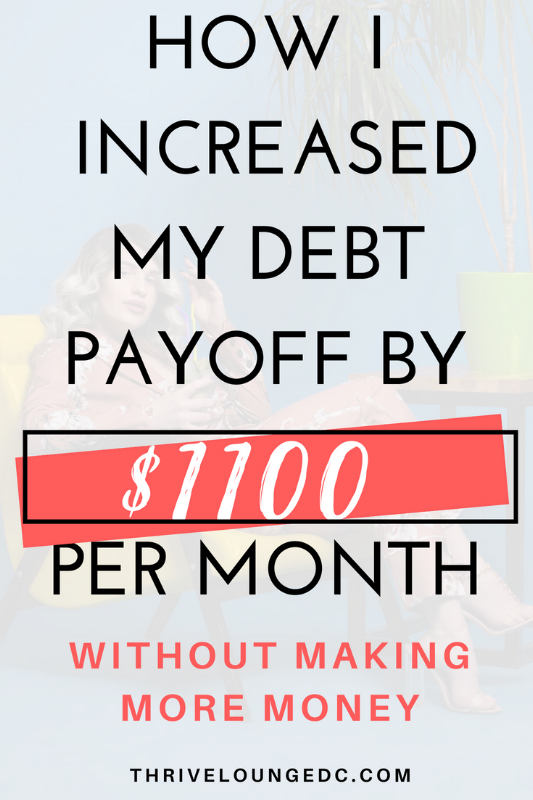 Every month, I was struggling to find new ways to pay my debt off. I cut back on everything I could think of. I started turning the lights off during the day time and instead opening every window possible. I didn't use the heat in the winter or the air conditioner in the summer unless I was dying. I went on a strict (read: cheap) diet and stopped going out to eat. Then, when that money wasn't adding up to much savings, I got a little more drastic. I even let my girlfriend's 80-year-old grandfather move in with me for 5 months. After all of that, I STILL only managed to save a tiny bit. I realized as passionate as I was, my lifestyle would not allow me to pay any more. So I did what any reasonable person paying off debt would do: I decided to change my lifestyle. Over the next few months, I implemented a few tiny lifestyle tweaks that took me from making tiny payments on my debts... to massive ones. How Did I Get Here In The First Place? I went to four years of undergrad, mostly with scholarships, and was able to graduate with only $15K of student loan debt. Unfortunately, companies didn't give a crap about my degree after college and I struggled to find a job. I began working as a babysitter while I tried to figure my life out. I loved the families I worked with and I got really comfortable. After my last babysitting gig, I was coming up on 25 (prime quarterlife crisis years) and I knew it was time I found one of those adult jobs. Still, not one job would call me back. So I did what any self respecting woman with no job prospects would do: I went back to school. That would buy me enough time to figure out how to put a resume together that made me look good, make some high-powered connections (after I learned how to properly network), and get some type of internship under my belt that would knock the socks off these hiring managers. My trip to grad school worked. I got the piece of paper and landed the job... and it only cost me $25K. In total, I ended up with $42K in student loan debt when I finally had enough income to start paying. To be honest, the concept of capitalized interest pissed me off. Hi, your principal has been updated... and we're adding $1000! I might be paraphrasing a bit, but you get the gist of it. So I called my student loan company and realized that my loans had 25 year loan terms where I'd end up paying 3x what I took out at the end of the term. I felt like the entire loan system was a scam. ... and I don't like being scammed. Plus, I now had this cushy adult job. I figured that now was as good a time as any to get started paying that debt off. I made the decision to pay off my student loan debt in January 2017. Over the next few months I struggled to make larger payments on my loans. I would pay an extra hundred here and there as I could, but the interest was increasing at $210/month (and accruing daily) so every payment felt like throwing money into a black hole. That's when I realized if I was going to get out of debt, I would have to do soemthing drastic. In the ten months that followed, I paid $15,582 in student loans. That's an average of $1,558 per month --- and an increase of $1,156 towards my debts. My largest expense was the same as many Americans: Housing. Every month, I was spending about 50% of my income on housing. I had rent, heat and electricity, valet trash (which was rolled into rent and you couldn't opt out) and water. While I could pay it every month, it was a struggle to pay that and make higher payments towards my student loan debt. On a vacation trip to New York, I visited an aunt and realized that she has a guest bedroom. That's when the idea hit me. I pitched her to move in and pay her a fraction of my current rent. That would mean that she got some extra money coming in - and I would be able to put all of those housing savings toward my student loan debt. This move meant that I would be able to reduce my rent and stop paying for utilities, valet trash and internet all together. To be honest, I've always hated cards. I mean, I could literally rant for hours on the topic. But for the purpose of this post, I'm only going to talk about the costs. Car Note: Fortunately I bought my car cash so I didn't have a car note, but that's not typical. Car Insurance: My least favorite of the car expenses. You pay a monthly car insurance hoping that you never actually have to use it. Because if you do get into an accident, your car insurance will increase and you'll still have to pay a deductible to get your car fixed. Gas: If you're fortunate to live close to your job (or not have to go into an office at all) you can still easily spend $20-$30 per week on gas. Many people have to spend much more than that commuting to and from jobs that are an hour or more away. Maintenance: Generally speaking, cars have something weird that goes wrong every 2-3 months. Whether it's breaks, tires, windshield wipers, oil changes, miscellaneous fluids or random noises that go bump in the night - you will have to get something fixed on your car. Tickets: I was living in Maryland, in between DC and Baltimore. Both areas have great opportunities for you to accumulate tickets. There are strategically placed cameras pretty much everywhere to surprise you and take your hard-earned money. Side note: In addition to all of these expenses, you'll also have to give up some of your time. Cars take time to clean, maintain and process. I hated that micro pain I would feel when I got yet another ticket in the mail. You'll spend a lot of your time at a dealership or body shop or in line registering tags or whatever random things you need to do to simply own a car. That's on top of the time you spend earning the money to spend on it. I got rid of my car - and earned my inner peace. Once I lowered my expenses, I had a giant gap between how much I was earning and how much was going to bills every month. I started to put all of those savings towards my student loans. With my rapid pay down strategy, I plan to be out of that 42K of debt in less than 2.5 years from start to finish.